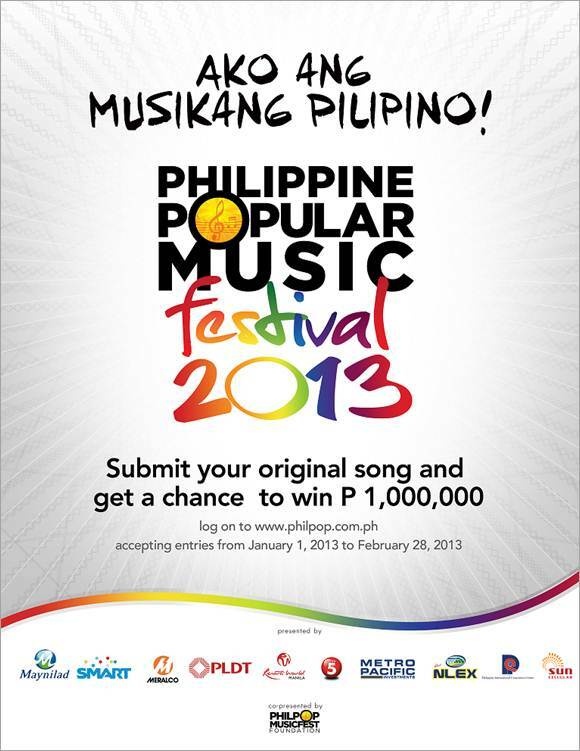 Philippine Popular Music Festival songwriting competition gears up for its 2nd run this 2013. As early as January 1, entries will be accepted on www.philpop.com.ph, with an extended deadline running until March 31, 2013. PhilPop Musicfest Foundation Inc. which involves itself in nation building through music organizes this songwriting competition. It seeks to identify deserving songwriters who can inspire and spark positive change through their songs and are given the opportunity to shine. Expecting to break the record of 3,000 participants in the initial run, Philpop, under the baton of its Executive Director Maestro Ryan Cayabyab, laid out a more comprehensive and arduous screening process to find the Top 14 Finalists. The competition is open to amateurs and professionals, participant must be of Filipino descent so even those residing abroad can join. The song entry may be written in a popular or new song genre, or a fusion thereof, in any form or structure. Lyrics may be in Filipino, in Philippine regional language, a Philippine dialect, English, or any combination thereof. The song entry must be entirely original. It must not be licensed to any publisher; has not been printed and distributed as hard copy; or through the internet; has never been previously recorded and must not infringe on any existing copyright or any other rights. It must not have been performed live in any venue, on traditional radio and television, or internet, or pre-recorded and uploaded on the internet, or recorded on video or other format for future broadcast. The million-peso champion of the first ever Philippine Popular Music Festival is former Akafellas member Karl Villuga with his song “Bawat Hakbang.” The composition, which was about overcoming a personal crisis, was interpreted by Villuga along with his former groupmates and crooner Mark Bautista. First runner-up award went to Australia-based Soc Villanueva with his R&B song “Kontrabida” sung by Sam Concepcion. Young composer Toto Sorioso won the second runner-up prize for his composition “Tayo Tayo Lang” performed by former Sugarfree frontman Ebe Dancel while first timer James Leyte, who works in an IT department, won the Smart People’s Choice Award for his reggae-influenced song entitled “Brown” co-interpreted by Brownman Revival. Maestro Cayabyab clarifies that even the past winners can still join the competition. “We are continuing to promote the songs from the Philpop and the album while drawing up strategies to further thrust these songwriters and songs into the spotlight. We are looking forward to again stage the biggest and most illustrious song writing competition in Philippine history with an even more songwriters vying for the 1 million pesos grand prize this 2013," shares Maestro Cayabyab. PhilPOP is supported by Maynilad, Smart, Meralco, PLDT, Resorts World Manila, TV5, Metro Pacific Investments Corporation, NLEX, Sun Cellular, the First Pacific Leadership Academy, KBP, and Philex.